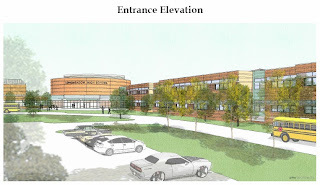 I attended the SBC meeting last Thursday to hear an update on the Longmeadow High School project including the cost and prioritization of possible “add alternates”. SBC members, representatives from Joslin Lesser & Associates, OMR Architects and Gilbane Building Company were in attendance- a total of 20 people. As has been the case for past meetings, public attendance was almost non-existent (2 town residents, including myself). Update: Latest cost estimate is now ~ $160K. Update: Latest cost estimate is now ~ $250K -$50K credit for original manual lift design = $200K). The system being considered is an electro-mechanical lift mechanism that will result in a stage extension of 8 ft x 43 ft. The SBC voted to select natatorium as priority #1, lift mechanism as #2 and the under terrace storage area as priority #3. The SBC vote to include all of the above 4 items in the project bid specification. The SBC decided to not include the synthetic turf as an add alternate with the project bid specification package but to defer a decision until more information could be developed. A SBC sub-committee (Barkett, Wrabel, Joyal, Greenberg and Bistran) was appointed to study the synthetic turf options and provide the SBC with additional information. The overall project detailed drawings and design package is now 60% completed. It is expected that the 90% design package will be completed by the end of February with a targeted March 9, 2011 project bid package release. Tom Murphy of Joslin Lesser & Associates provided the SBC with an update of the estimated project costs based upon the 60% design package. The results are based upon estimates from multiple sources. The range for the latest cost estimates was very small ($63.6 million – $63.8 million) and very close to the original estimate provided to the MSBA ($63.8 million) which was based upon the project schematic design which had significantly less detailed drawings and specs than the 60% design package. Bottom line: The project costs are on target vs. the original estimates which is good news. However, it should be noted that these numbers do not represent the Guaranteed Maximum Price (GMP). It was explained to me after the meeting that these numbers are not inclusive of all costs (e.g., architect fees, some construction site costs, etc. are not included). The total project cost is still estimated at ~ $78M as originally approved by Longmeadow voters. Only after the project bids are submitted sometime this spring will the project GMP be determined. The current construction bid environment is still pretty soft so Longmeadow will likely benefit from lower bids than what has been estimated. 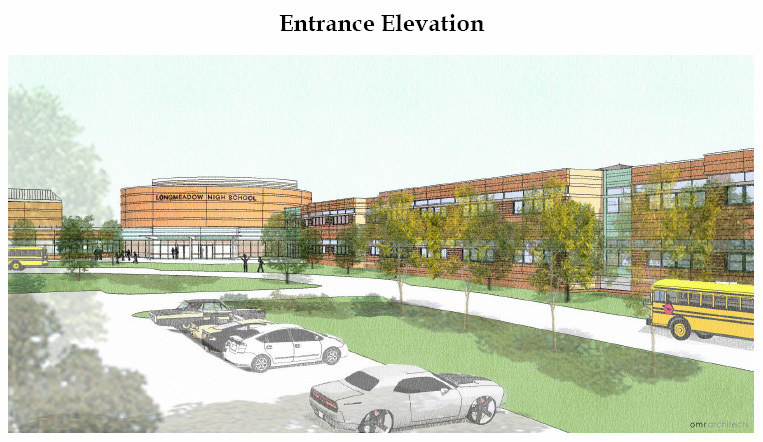 The new Wilbraham-Hampden Regional High School ended up at $65M vs. an original estimate of $82.2M. Hopefully, Longmeadow will be able to achieve a similar savings. After listening to the SBC discussion about the various add alternates and their merits, it seemed to me that the stage lift, natatorium upgrades and the outdoor storage options are high valued and should be included with the project. Furthermore, these alternates represent a total of $510,000 which is less than 1% of the overall project cost. The additional landscaping seems a bit over the top given that the project has significant landscaping costs already included as part of the original project scope. At this meeting I received a copy of the December 16 meeting minutes. However, as of today, meeting minutes from the November and December meetings have still not been posted on the SBC website. SBC meeting minutes should be posted on the town website in a timely manner. During the past two meetings it has been interesting to hear various SBC members speak to the issue of “prudent” spending of taxpayer money. I’m glad to see that the SBC did not include synthetic turf practice fields as part of the add alternates specifications. However, I am concerned that this item has not disappeared from future consideration. I watched the Longmeadow Select Board meeting this past Monday night and found one particular aspect of the discussion about the problems being encountered with the installation of new water meters very concerning. New water meter installation work has been underway for one "billing" zone (1 out of 6) over the past few months. Without getting into the details of the discussion it turns out that about 25% of the homeowners in this zone have no contact phone number registered with the town nor is the number published or found in any of the conventional sources. This includes the town's database for the Emergency Notification Phone System which the town uses for calling town residents about emergency or crisis situations. If the 25% figure is typical for the rest of the town, then there are approximately 1400 residences in town that cannot be notified quickly via telephone in the event of town emergency such as a gas leak, chemical spill, tornado or other emergency event. I would urge everyone in town to make sure that they have a contact number (cell, or land line) registered with the town to be used in event of an emergency. Simply click on the above graphic or visit the town website to sign up.